He plays in Monogram from beginning. 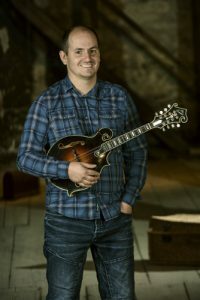 He was awarded several times as a „Mandolin player of the year“ in the survey of Czech bluegrass association. Several times awarded by SPBGMA as the „Best mandolin player“ in 1998. He cooperated or cooperates with many music bands like Bill Keith, Chris Jones, Blanket and Fragment in famous Nashvill Grand Ole Opry. He’s too invited as a studio player with Petr Spálený, Daniel Landa, Daniel Hůlka, Jitka Molavcová. He’s so member of bands Nugget, Groovy Lix, Jimmy Bozeman and The Lazy Pigs and he plays with Tony Ackerman. He plays „Krishot“ mandolin.